Brows have been on trend the last couple of years now and knowing how to do your brows and using them to your advantage is a trick we all should know about. We have all heard how different brows are suited to different face shapes, but what about using your brows to appear younger. Aging is something that happens to everyone, whether we like it or not and it's just a process of life we have to accept. Imagine being able to look younger without having to inject your face with botox and fillers. Ursula Cervellone founder of Feather Brow Couture knows how the right brow shape can help you look younger by using these simple tips. Don't think too thin – Thin brows can tend to make you look older, a thin brow can give a harsh or unflattering look to any face. Making sure your brows have more depth and thickness than a thin pencil line will help any face appear younger. Soft baby strokes appear far more natural than a bold brow. The gap – Making sure your brows are not too far apart as they can make the width and length of your nose appear larger. With age we do not want to draw more attention to an area, we want to keep the face as soft as possible. The gap between your brows should be the same width as your nose point, anything bigger than this will also make your face look out of proportion. You can use your brows to also create an illusion that your nose is smaller by doing them a little closer together though if too close together it can also make you appear to be frowning or angry when you are not. Keeping the curves – Keeping the curves with your brows is important though your natural brow height and angle of the curve will determine the right shape. To look more youthful keep your brow more a gradual higher arche and lifting the tail height will lift and open your eyes. The end point – The end of your brows should finish sharp, a thick sudden end to a brow will appear too heavy on the face. Making sure your brow is not the same thickness and boldness throughout the whole brow, it should be a nice gradual flow. See the experts – If you are unsure about the shape of your brows get them shaped by a professional, they know what is best and the perfect shape for you, they are easily maintainable after this. If you also have lighter brow hairs or greys getting them tinted is great for the boost of colour they need. If you have quiet thin or low brows and you do not want apply a brow filler every single day, try considering cosmetic eye brow feathering is a great long term investment and are extremely natural looking. As we age we seem to loose more brow hairs and they are more sporadic so it becomes a lot harder to get our desired brow shape without having to add to it. Our natural brows also drop lower as we age due to muscle, fat & bone atrophy, loss of collagen making you look tired or sad so it's important to bring your brows a little higher so it gives your eyes a more youthful appearance. 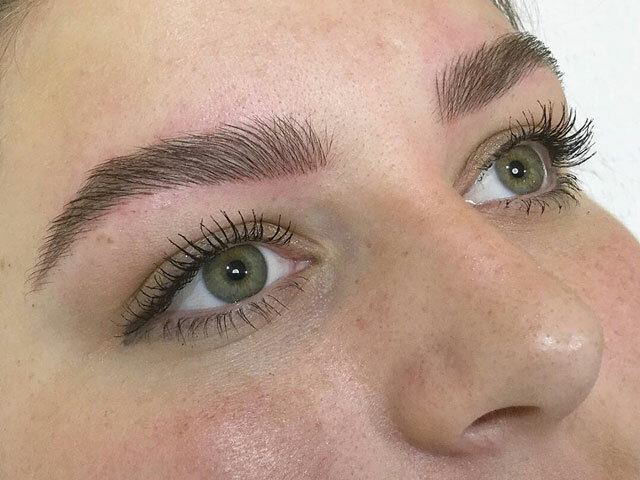 Your face is changing constantly with age and it does affect the muscles, bone and fat under and around your brows so it's not always a great idea to have a permanent brow tattoo but more a semi permanent option like Feathering as it lasts 1-3 years. This way if you want to change your brow shape or color years later you have that option, especially when going higher above the brow bone to look younger. For those wanting an extreme brow makeover Ursula works side by side with a experienced cosmetic nurse Stephanie Azzi who uses dermal filler and anti aging injectables to do an overall brow makeover over transformation. This is done by correcting brow symmetry using the Feathering tattoo method also injectables to lift & relax the surrounding muscles and filler used in the hollowing around the brow and temples to restore volume that's lost with age. A consultation is advised for what's best suited for you.